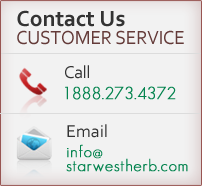 Starwest is committed to selling high quality natural products while preserving the environment. We want to contribute to a more sustainable planet, and we conduct our business in a way that allows us to maintain our standard of environmental dedication, with commitments to sustainable and organic farming and caring for the environment. Strongly committed to the organic industry and having worked for the advancement of sustainable organic agriculture since 1980, we are proud to offer an increasingly large selection of certified organic botanicals, herbs, spices, and teas. Certified organic products are grown and harvested without the use of toxic and persistent pesticides and fertilizers, and offer a more sustainable option for feeding ourselves and our communities. Organic farms can even support higher levels of wildlife, and improve entire ecosystems and ground water. Sustainable organic farming practices can produce crops without depleting our earth’s resources or polluting the environment. It has many environmental, health, and social benefits, and continues to have a significant impact on the quality and availability of water and soil quality. We are continually developing and maintaining long-term, mutually beneficial partnerships with suppliers and growers who are committed to sustainable and organic farming practices. All of our certified organic products are grown and harvested in accordance with the USDA National Organic Program. Our products and manufacturing facility are both Certified Organic by Quality Assurance International (QAI). We make every effort to source and select ingredients from natural renewable sources, and we are dedicated to the conservation of plants and the preservation of their natural habitat. We support sustainable wild collection practices to protect species from becoming endangered. We are a member of United Plant Savers, a non-profit organization that helps spread the word on endangered and at risk plant species. Their mission is to protect native medicinal plants and their native habitat while ensuring an abundant renewable supply for years to come.